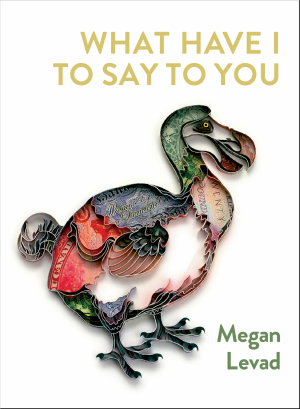 San Francisco poet and librettist Megan Levad’s second full-length poetry collection, following Why We Live in the Dark Ages (Portland OR: Tavern Books, 2015), is What Have I To Say To You (Tavern Books, 2017). Composed as a book-length lyric suite, Levad’s poems explore the intimate at an extremely high speed, moving through the imagination and the body with great detail and dexterity. As she writes: “IN THAT SCENARIO / I think I would // save your mother // you would get / the fifty-fifty // I would drown // the most romantic / way to go // But I might be wrong […].” Levad’s first person accumulation of pieces read as though it could be a letter composed at the end of a relationship or affair, or an interior monologue on what might have gone wrong, ending up as a curious blending of both that doesn’t necessarily require to be read in order to comprehend. Levad’s epistolary accumulations are intriguing, and move from confrontation to meditation, interior monologue to direct speech. The “you” of her title, in a certain way, becomes superfluous, or at least secondary, making the remainder of her title a question she works with great attention and detail to answer. What Have I To Say To You might suggest a direct response to another, but it feels just as much a kind of intricate, lyric character study composed as monologue. Just who is the “I” that is speaking, and what has she to say, exactly, to anyone?